Peacock, D. (2014). Dean Peacock Affidavit. Sonke Gender Justice: Cape Town, South Africa. 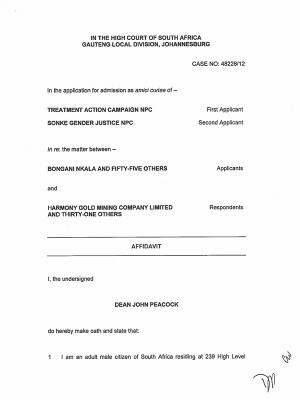 Peacock’s affidavit, on behalf of Sonke, shows the implications of illness and unemployment on the children and families of sick mineworkers and the impact of silicosis on women and girls in particular, who often bear the brunt of having to care for the ill former mineworkers.